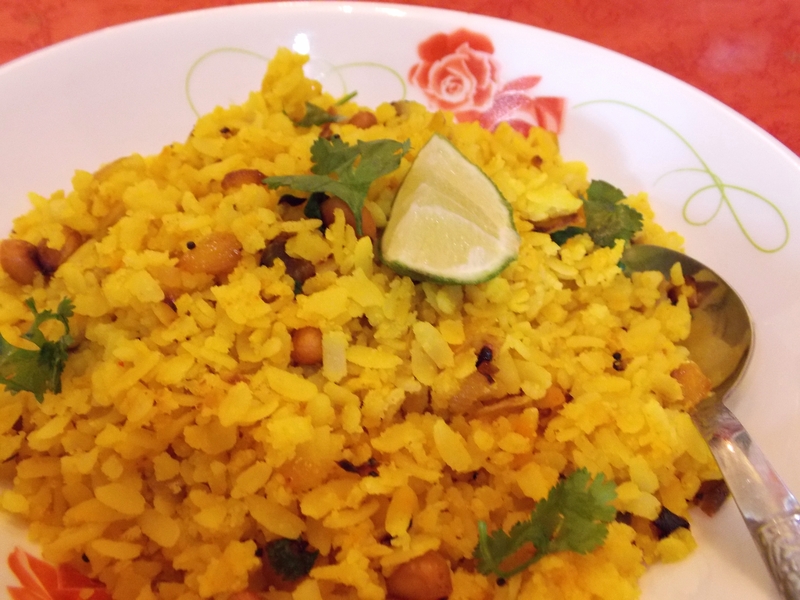 Rise and shine to Poha. A popular Indian breakfast recipe of pressed rice. Wash the poha in a colander or strainer (don’t soak them in water). Poha should be moist but not mashed. Add salt and 1 teaspoon turmeric and mix lightly. Dry roast the peanuts in a pan until crunchy. Take them out and keep aside. Heat oil in the same pan. Add mustard seeds and when they splutter add asafoetida (hing) and curry leaves. Sauté for half a minute and add onions and continue to sauté till they become translucent. Add the remaining turmeric powder, little salt and mix. Sauté for two minutes. Add green chillies and peanuts and sauté for a minute. Add poha and mix well. Cook till Poha is nicely heated. Leave the poha covered in the pan for two minutes. Remove the lid and add lemon juice and coriander leaves and mix lightly. Serve hot with lemon wedges or tomato sauce or with a hot tea. Wow, this sounds delicious Anugya! I love seeing how breakfasts vary with country and culture, it’s crazy how much they can differ! I love this Indian breakfast you’ve made, I’m not a morning person by any means but I would definitely get up early for this! Thanks so much for brining it along to Fiesta Friday, have a great weekend! This turned out yummy.. Must have for everyone.